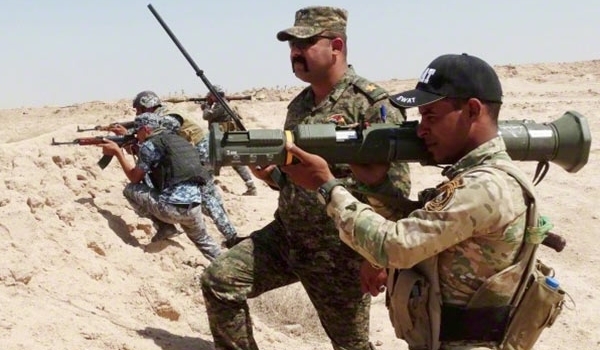 JNN 24 Aug 2015 Damascus : Iraqi Defense Ministry Spokesman Yahya Abdul Rasoul said that the country’s army men stormed the ISIL Takfiri terrorists’ centers and retook full control over the island of Samarra in Salahuddin province. Abdul Rasoul said that at least 150 ISIL fighters were killed in the Iraqi army’s operations in the Samarra Island. On Tuesday, the Iraqi defense ministry announced that massive offensives of the Iraqi Army alongside the volunteer forces have forced the ISIL Takfiri terrorists to retreat from the Northern fronts of Ramadi. “The Iraqi army with the support of Shiite forces of Hashed al-Shaabi, arrived in the area of Albu Hais in Ramadi Island, in the Northern side of Ramadi city, after fierce battles against the ISIL terrorists, who are fleeing from the fighting area,” the ministry said in a statement. Hajji Mutazz, the Islamic State of Iraq and Syria (ISIS)’s second-in-command, was killed in a U.S. military airstrike on August 18, the White House confirmed on Friday. “Fadhil Ahmad al-Hayali, also known as Hajji Mutazz … was killed in a U.S. military air strike on August 18 while traveling in a vehicle near Mosul, Iraq, along with an ISIL media operative known as Abu Abdullah,” White House spokesman Ned Price said in a statement. The White House said the dead leader was a “primary coordinator” for moving weapons, explosives, vehicles, and people between Iraq and Syria. He was in charge of operations in Iraq and helped plan the group’s offensive in Mosul in June of last year. The United States and its allies stage daily air strikes on ISIS targets in the group’s self-declared caliphate in Iraq and Syria. A drone strike last month killed a senior Islamic State leader in its Syrian stronghold of Raqqa. US is towing the same Policy in Iraq and Syra as with the Afghan Taliban ,where Once they created Taliban to over through the Russian Regime and get the control of the Gateway of Russian Regime , and then they were declared the enemy , same is the case with the ISIS , as there are ample proves that the US and Western Allies in collaboration with the Saudi Monarchy funded and created ISIS , the Most Brutal and Savage Bunch of terrorists , and now even condemn and show their acts against them , to Prove the World that the So called Super Power of the World , is against the terrorism , while the Back door channels are always open for such terrorist organizations , to terrorize the General Public of the particular Country , which Oppose and resist the Presence of the US Troops and Influence in their Homeland . Hayali – also known as Abu Muslim al-Turkmani – was reportedly a former Iraqi officer under Saddam Hussein and had served time in a U.S.-run prison before becoming “the right hand man” of ISIS chief Abu Bakr al-Baghdadi. One counter-terrorism specialist cautioned that the impact of the killing on ISIS could be short-lived. “My experience in looking at the Islamic State suggests they have demonstrated  an ability to move people up into positions” when high-ranking operatives are killed, said Seth Jones, a former Pentagon official now at the RAND Corporation..
Fragments from mortars used by the Islamic State of Iraq and Syria (ISIS) to attack Kurdish forces had traces of chemical arms agents, a field test conducted by the U.S. military showed. Marine Corps Brigadier General Kevin Killea, chief of staff for operations against ISIS, said the field test was not conclusive proof of chemical weapons use, and the fragments are currently undergoing more definitive testing to confirm the finding. U.S. officials have been looking into reports that ISIS militants used the chemical weapon mustard gas in the August 11 attack in Makhmour. Similar reports surfaced in July. Killea told Pentagon reporters on Friday that Kurdish forces brought the mortar fragments to U.S. forces for testing, so there may be questions about the chain of custody of the evidence. This entry was posted in Iraq News, Jafria and tagged Haji Mutazz, Hayali, Iraqi Army, Iraqi Forces, IS terrorists, Islamic State, Syria, White House. Bookmark the permalink. ALHAMDOLILLAH , PAJI MUTAZZ IS NO MORE. THEY DONT ADMIT BUT HIS BOSS ABU BAKR IS ALREADY WASIL E JAHANNUM . TO KEEP THEIR NON EXISTANT MORAL THEY DONT ACCEPT THE DRONE KILLING OF BAGHDADI. IN RECENT MONTHS IT IS SURE THEY HAVE NOT BEEN ABLE TO CAPTURE ANY NEW AREA WHILE THEY ARE IN CONSTANT RETREAT FROM VARIOUS POCKETS THEY HAD CAPTURED BY SURPRISED ATTACKS. NOW THE ISIL/ I.S. IS IN FULL DECLINE AND EVERY DAY HUNDREDS OF THEIR MENS ARE BEING KILLED . THEIR END COMPLETELY IS NOT FAR , ALHAMDOLILLAH .